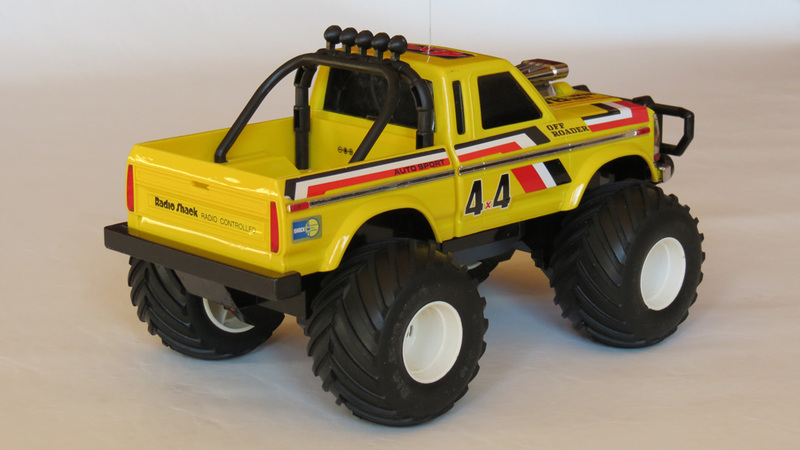 This versatile and robust pick-up truck was one of Tandy’s best-selling R/C toys for several years, and remains fondly remembered by many people. It was manufactured by Taiyo. 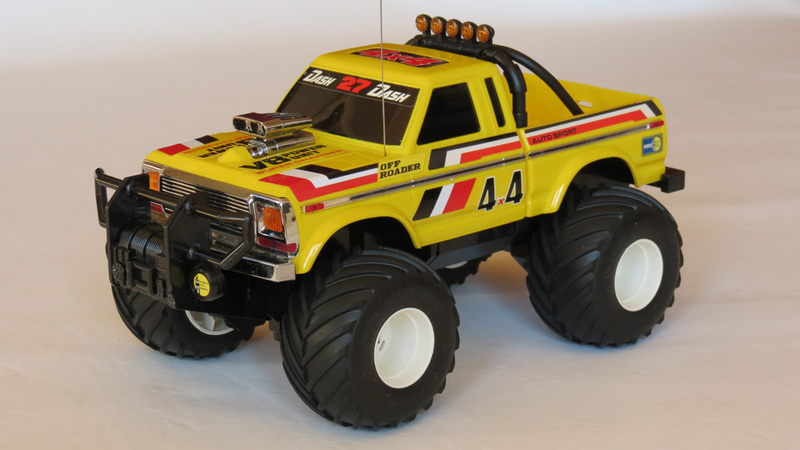 In the mid-1980s, R/C cars of all kinds were experiencing a boom in sales and there was a lot of creativity and innovation as different companies rushed to capitalize on the demand. Mk2 – Differences: Larger wheels, lower profile tyres. 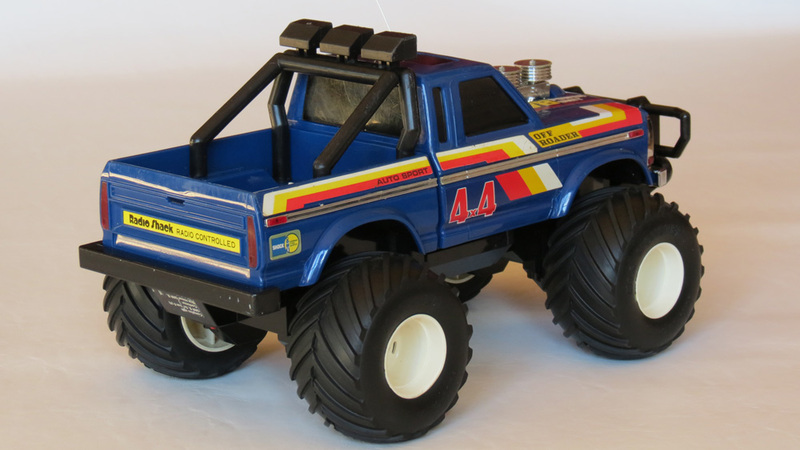 Just as realistic off-road sand rail buggies with large rear wings and front bumpers were hugely popular, so too were monster trucks following the arrival such impressive hobby grade models as the Marui Big Bear and the Tamiya Blackfoot in about 1984. 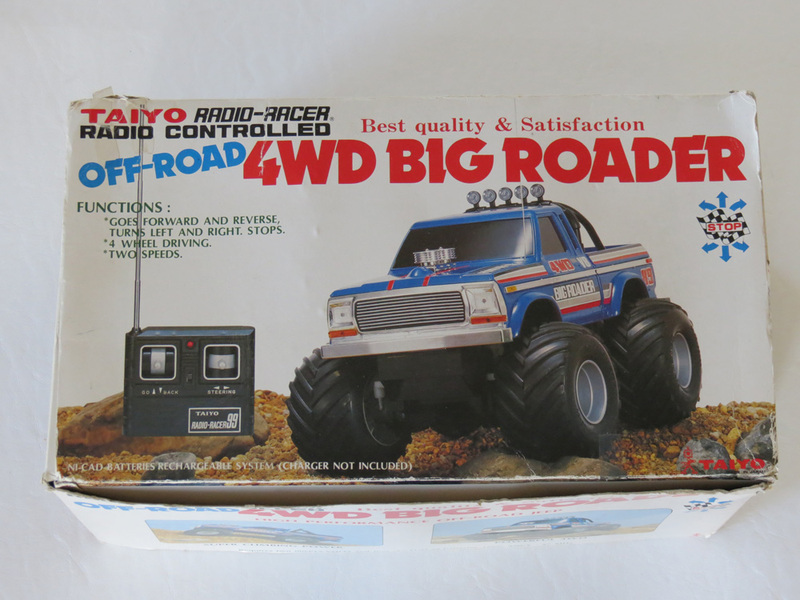 As always, toy-grade R/C manufacturers tended to follow these trends, but by as early as 1983 (before the hobby grade brands) Taiyo had released a solid little monster truck style off-roader called the Big Roader. 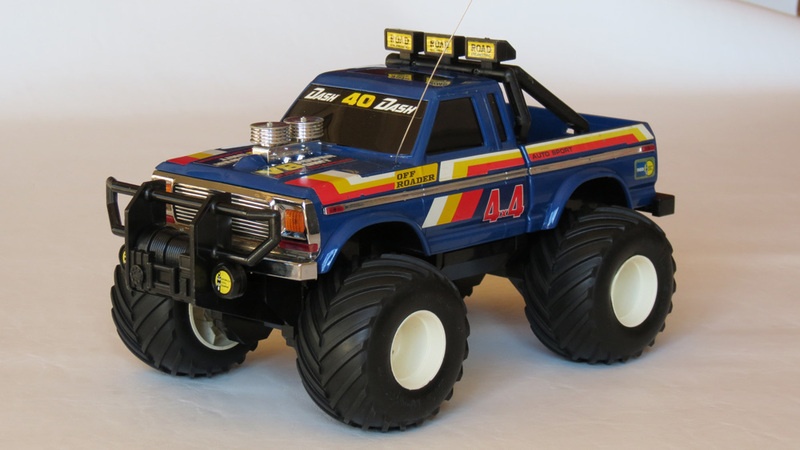 Clearly inspired by the famous full size monster truck called Bigfoot, which was the world’s first monster truck and debuted in 1979, the Big Roader was a very faithful (though unofficial) recreation of this vehicle in 1/16 scale. 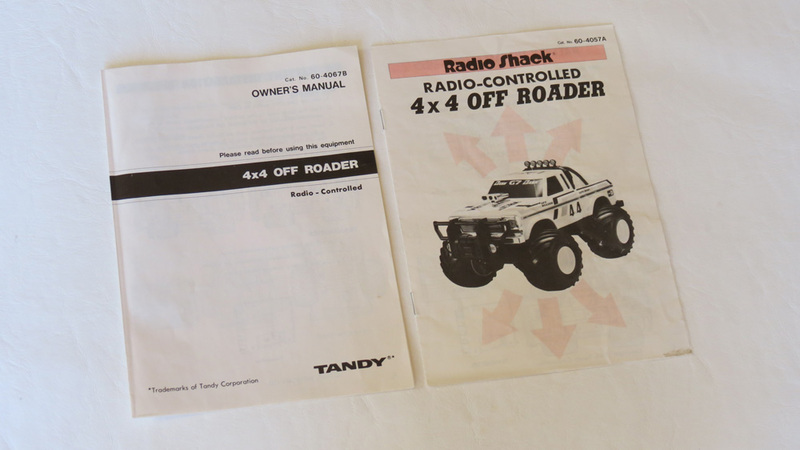 Two years later, the Big Roader model was noticed by the Tandy/Radio Shack store chain, and enlisted Taiyo to begin manufacturing a new release of it for them, which they dubbed the 4×4 Off-Roader. Taiyo’s market reach benefited greatly from the help of Tandy/Radio Shack, and by selling the 4×4 Off-Roader throughout the USA, Canada, Europe and Australia, it went on to become the most famous incarnation of this vehicle. As they often did, Tandy/Radio Shack had the car “custom manufactured” so that it came with Radio Shack-specific body work, decals, box art and instructions. They also offered two varieties – blue or yellow, each on a different fixed frequency so that you could buy both and race them. And thus the Tandy/Radio Shack 4×4 Off-Roader was born. 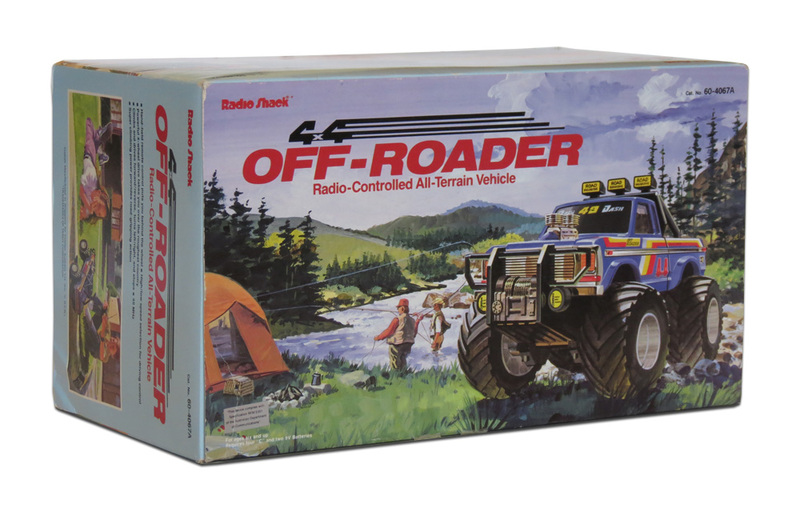 Obviously a popular seller, the 4×4 Off-Roader ended up having possibly the longest production run of any R/C model ever sold at Tandy. It was first sold in Australia in 1986 and 1987. Then it seemed to be dropped in 1988, only to reappear again for another 3 years from 1989 to 1991. For me personally, it wasn’t until 1989 that I was lucky enough to receive one of these trucks for Christmas. And in the weeks leading up to Christmas 1989, I visited several Tandy stores for some in-store “test driving” – which was a great feature of Tandy stores in those days. 1989 was also yet another classic year for their stores, with a great line-up of different R/C vehicles. I wanted to own them all. I can clearly remember one of the Tandy sales staff demonstrating the power of the 4×4 Off-Roader for me one day, by driving over his feet to demonstrate it’s climbing ability. 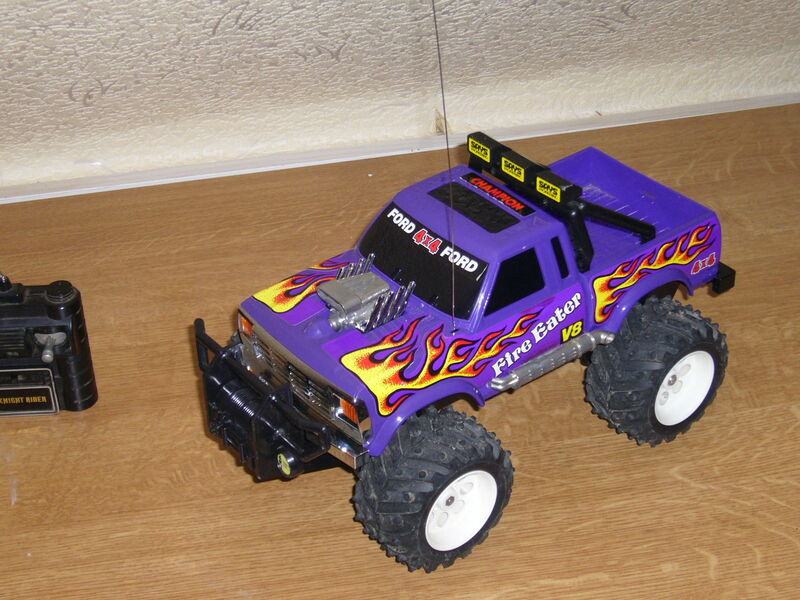 It had a real go-anywhere feel compared to almost any other R/C toy in it’s price range, at that time. So what made this truck so special and such a popular item? Well firstly, it was another quality toy from Taiyo, who later went on to release the very popular Jet Hopper. Well-formed, solid plastics, quality rubber tyres. It’s quite heavy with the batteries loaded, and it’s also quite a neat, stylish and realistic mini monster truck. I had a lot of fun as a kid racing my Jeep Renegade (also manufactured by Taiyo) against my 4×4 Off-Roader, and the two were the subject of many years of ‘titanic’ backyard rallies as they were quite evenly matched in speed. Due to it’s weight and it’s internal gearing, and those large tyres, the 4×4 Off Roader has a tendency to pick-up speed quite slowly and realistically too, with a sort of deep ‘engine noise’ due to it’s internal gearing. The gearbox has a choice of Low/High speed, and in ‘High’ the car can reach a reasonable pace for what it is. This is particularly evident downhill where the gearbox seems to ‘let it go’ almost as fast as gravity can take it. Uphill in ‘High’ gear is much more of a struggle and only steady inclines are possible. ‘Low’ gear is a whole other ball-game of course, as this offers a high-torque, go anywhere ability. 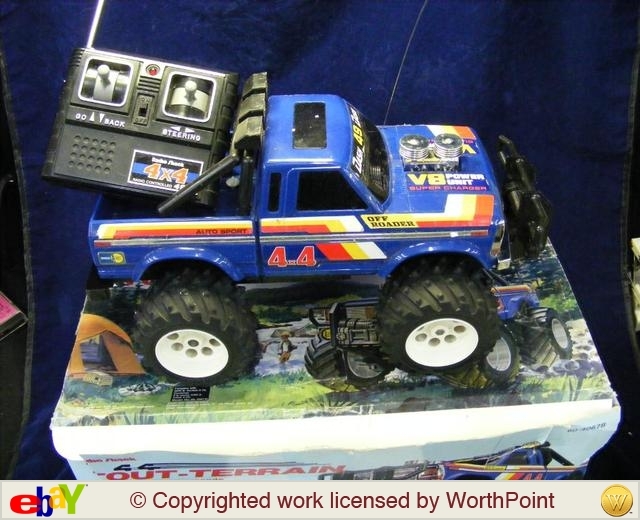 These days they call it “R/C crawling”, but for a 1/16 scale R/C toy in the mid 1980s, the 4×4 was great fun to climb over small rocks, feet, and even up inclines as steep as 40 degrees. I had mine driving through thick snow on one occasion, and scooting around on a frozen road (in front of some stranded full-size vehicles which were unable to move). Fun times in winter. Of course, receiving my first 4×4 Off-Roader on Christmas morning in 1989 was very memorable in itself, but sadly so was the moment on Boxing Day when I accidentally slammed it into a verandah post, breaking the front bumper! Snap. Luckily Tandy did offers spare parts in those days, via mail order. It took a few weeks, but I was actually able to replace my bumper with a new one. While most of the car is quite tough and well made, the body plastic is hard and inflexible and those bumper ends are pretty vulnerable. Another thing to note is that the car is not digital proportional, and while the radio is the same excellent little unit later used on the Jet Hopper, it does require you to be applying forward or reverse at the same time as applying the steering or else the steering won’t operate. This was an early design found in a lot of 1980s toy R/C cars, but I think it was also partly why I hit that verandah post all those years ago – the car veered left at full speed when I wasn’t quite sure it would. But the more you drove, the more you perfected your technique. I always loved the decals on this car – retro 80s pin-stripes and “Radio Shack RADIO CONTROLLED”, “Gasdruck, Stoss, Dampfer”, “Auto Sport” and so on. You’ll also notice that the yellow vs blue versions aren’t simply a different colour – they have a different roll cage and exposed chrome engine head as well. It should also be noted that the 4×4 Off-Roaders that were sold in 1991 had larger wheels with lower profile tyres. I consider this to be the Mk2 of the model and I think their performance was even a tiny fraction better than the Mk1, perhaps on account of wheel diameter. But the Mk1 version with the fatter tyres (as pictured on this page) is still the more well-known and longest-selling, and probably the one most people are looking for today. Which leads to the question of collect-ability. Over the years I have certainly seen quite a few 4×4 Off-Roaders appear on eBay. In fact, you should see one come up every other month. But as always with ready-to-run toy R/Cs, there are very few out there in great condition (due to the fact that they were so easy to take out of the box and play with). Value really depends on condition, but mint examples of this car are easily worth into the hundreds now. There’s no doubt that this is an extremely well-known R/C toy that was very versatile and loved by many during the late 80s and early 90s. It was undoubtedly one of my all-time Tandy R/C favourites, and is probably even one of the cars people remember the most when they think of “Tandy R/C”. Hey there from brissie. Love reading your posts really great informative stuff keep up the great work. You seem to have a huge collection and was wondering if it all comes via eBay? I have a young fella who wants a r/c 4wd and the post on the Tandy 4wd is spot on what I had in mind but they don’t seem to make them that simple anymore! Just wondering if you had any tips on where to maybe find a similar item either new or nos or whatever. Thanks for your time and hope to chat soon mark. Thanks for the kind comments, Mark! Most of my collection has come via eBay, with perhaps 10% of it from private trading. But eBay still remains the best way to find rare and vintage things. The Tandy 4WD featured here is a very neat little truck, and if your son is set on having one, they do come up fairly often on eBay. If you find one in reasonable condition (not too worn out), there’s no real reason it wouldn’t last as well as a new toy bought from a store. Neither new or old toy RCs really have any spare parts available. So the only thing you’d be missing out on is a new store warranty. If however you prefer to get something brand new, I think the best option for something similar is Nikko – one of the few long time makers of R/C toy-grade vehicles that is still running (and makers of many of the vintage toys I’ll be featuring on this blog). Nikko have been around for over 40 years, and their Australian website – http://www.nikko-rc.net/ has a few little trucks and 4WDs that, while they probably aren’t as handsome as the ones in the 80s, still look fairly neat. On their site, click “off-road” in the left pane, then have a look at all the models under “12th Scale to 14th Scale” for something similar in size to the Tandy 4×4 Off Roader. The “Dirty Jeep Monster” has a pretty decent look. Try to purchase via the Nikko website, or via smaller Toy stores that stock them. I don’t mean to reply to someone else’s post with a completely different question but I couldn’t find anywhere else to add a comment at. I have found my yellow 4×4 and I want to give it to my child to play with but I can’t find the right charger. I have the cord that came with the toy when I got it but I remember there was an adapter that went on the end of the cord and then into the truck. Am I looking for the wrong thing, can I just get a 3v 300ma charging cord that fits the truck and use it? Hopefully someone can help. Thank YOU! Hi Rick – with the 4×4 Off Roader, if you want to charge batteries inside the car, you need a charger that delivers the same voltage as 4 x C size rechargeable cells (only the C cells will be recharged this way, the 9volt cell will not be charged by the car). However, I would recommend that you instead buy an external charger that can handle a variety of batteries and just charge the batteries that way. Hi Steve, I’ve replied in more detail via email, but the basic tip would be: check eBay for another 4×4, and you should be able to get a used one for about $50 or less. They are fairly common, and provided the one you buy isn’t a total wreck, you’ll have all the parts you’ll need. Just be gentle and take your time pulling them apart, as the plastics can be fragile. Never over-tighten the screws on toy-grade RCs when putting them back together, as threads can be stripped easily. 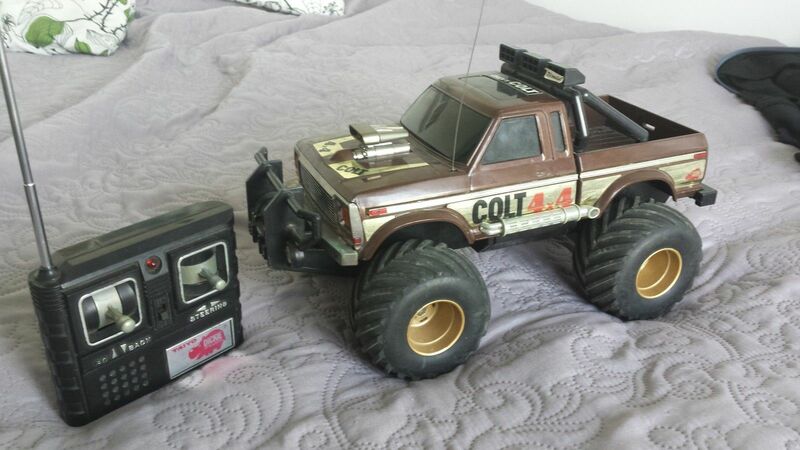 What a blast from the past, this was my first rc and I loved it. I had the yellow one and used it all the time. I wish now I kept hold of it as I do miss the little beast. I think back then I had the fastest one because my dad took the battery cables out through the back and fixed them to a 9v block battery the one’s with the coils on top lol. It was very fast and lasted a few times until the motor burnt out lol. I still played with it after as a push around toy. I would love to get my hands on a yellow one again and show my dad lol happy memories. Thanks for your post and images chap. Thanks the comments James. Definitely keep an eye on eBay. Sometimes, if you’re very lucky, even brand new ones can still come up. But used ones are reasonably common. 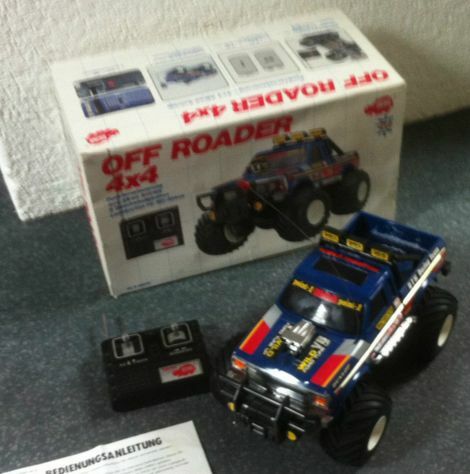 The Taiyo / Radio Racer 4WD BIG ROADER was first released in 1983! I have mine since Christmas 1984. The item No. 8345-27 (27 was for 27 MHZ). avaiable, with lateral exhaust pipe, tyres with different tread and so on. Radio Shack, Tyco, Dash, and any other brands. There was also a smaler version, about 1:20 Scale released in 1984.
hi, thank you for this blog its great! I have a well used version of this truck which has been coverted to full rc capabilities. The problem is the motor recently popped and is now beyond repair. Do you know of anywhere in the uk I can order a replacement motor and drive cog for this truck? I have very fond memories of this little truck. I got the yellow pickup around 1988 or ’89 and used it nearly every weekend. Dad liked the fact that it had a built in battery charger so he wouldn’t go broke keeping fresh batteries in the thing. In 1991 the First Gulf War was going on, and the buzz word back then was “Scud Launcher.” Being a developing tinkerer at the time, I removed the roll cage in the bed of the truck, and attached a launch pad for Estes rockets in the bed – the US version of a Scud launcher was born. I used the legs of the lauch pad as outriggers since the truck was extremely top heavy with a rocket and launch pad. I used the truck to haul the rockets to where I’d launch them and then drive the truck back home which was about 1.5 miles round trip (which was the limit on the batteries). I even made a small trailer so I could haul all the rocket gear as well (extra engines, igniters, tape, etc. ), and even with all the weight, the truck managed to haul everything at a walking speed. The low gear was good too for managing the steeper inclines on the way to the launch site. By 1993, the truck was pretty worn out and couldn’t go the entire 1.5 miles. High gear developed a clicking sound and the axles were badly worn. Also by that time other “priorities” took hold (cars, girls, etc…) and the little truck was put on the shelf. I don’t know what happened to it now. Maybe someday I’ll find it stuffed into a forgotten corner of my parent’s basement. That’d be a great day. Great stories Eric, thanks for sharing! Hello,I would like some help…. Hi Milos, I don’t think the manual would help much as it just contains basic info about the 4×4. Have you checked the battery contacts in the car and remote? The #1 cause of toy grade cars that do not work, is poor battery contacts particularly when there is battery acid leakage or corrosion. Clean those up, and if the car still doesn’t work, it might be a circuit board issue. Your next option is to find someone who understands and can repair circuit boards, and get them to take a look and test all the little transistors and capacitors. Final option is to buy another working 4×4 on eBay and use that for spare parts to fix yours. Hi Jhon – I would suggest you search ebay, and keep searching each week, for the items you are looking for. They will come up eventually. lovely atlast .i still have the blue one alive till now it was a gift from my dad when i was 2yrs old i was born on 1985.im looking forward to have it restore or hopefuly buy a new one same model now for my son.pls let me know how? ilove my toy for 26 yrs. Hi Amiel. As no spare parts were ever sold separately for this car, restoring yours is going to involve: carefully taking it apart and cleaning it, and replacing any broken parts with parts from another identical car. Used 4×4 Off Roaders are worth between $40 and $100, but a brand new one (if you can find it) will likely cost you $200+. Best of luck! Nice right up, I have a working dash 49 I have been saving that is in really good working condition. I have been searching and testing other new rc cars and trucks for my kids for Christmas and have found nothing even close in quality or drivability for younger kids. So I have bought myself a light hawk igniter to replace it and will be handing my off roader down to the next generation. If you say this truck is worth roughly $50 I have not found anything even close in build quality for less than $80, nor can I imagine them still working after all these years. Hey Ryan. Yes, the build quality and materials on RC cars from the 80s like the 4×4 Off-Roader were really very good. They were built to last – things like the rubber tyres on this one, will last forever. 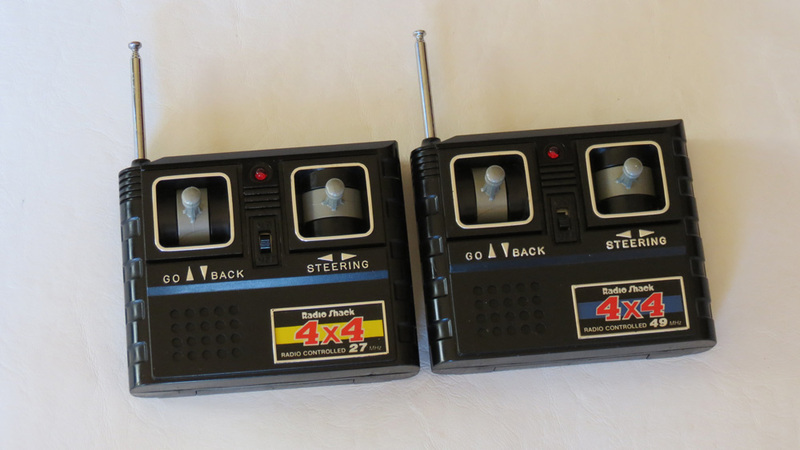 And yes, to get a working example today for $50 on eBay (in used condition, because mint ones will fetch much more), and then compare it to some of the $50 RC toys around now – it’s no comparison at all. Many of today’s sub-$100 RC cars are cheap and flimsy rubbish. You’re arguably better off with a used example of a legendary toy, than a brand new example of a crap toy found at Toys R Us. Using the Australian Reserve Bank Inflation Calculator, something that cost AU$99.95 in 1987 would equate to a price of AU$217.50 in 2012. 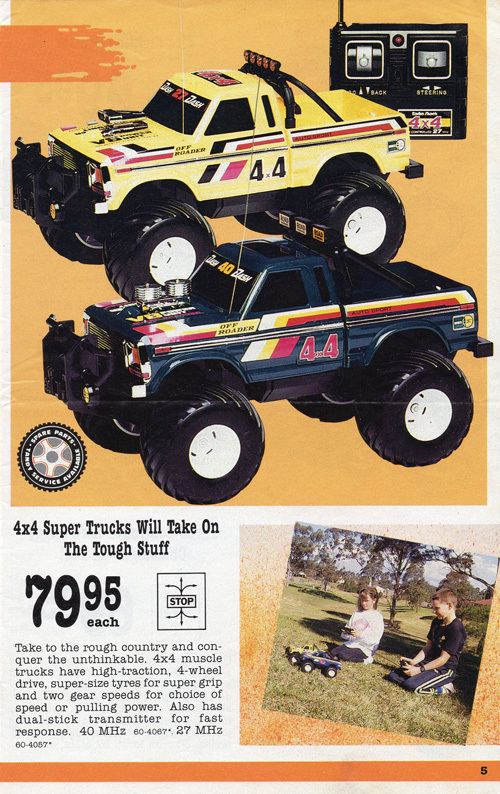 So the 4×4 was a pretty aspirational toy for its time – no wonder I was so excited to get mine in 1989! I know this is an old posting but I’d like to add my thoughts. I still have mine from when I was a kid. It’s the yellow one. I recently retrieved it from my parents’ attic. I imagine it’s been in there for over 20 years. It didn’t work at first. I cleaned up the battery contacts, replaced the on/off switch, and resoldered some of the wires to the circuit board. The truck works, but the original transmitter does not. I can use a spare 27 MHz transmitter to control the truck, and it works great. The tires however have degraded a bit. They have some permanent flat spots. Does anyone have any recommendations for replacement tries? Any help would be appreciated. Thanks! Oh man, Here I was reading your article about the original Hornet (yes, I still have mine some 25-30yrs later) and I saw this article linked in the side bar, my jaw dropped! I had a yellow one as my first (well, that I can remember now some 30+yrs later) R/C car and loved it. Drove it everywhere. At some point I removed the front bumper – either for looks or ‘cos it broke – and think I still have it sitting in the shed. My 2 boys got their first R/C cars for Xmas (the aforementioned Fastlane from TRU and some XQ Toys models – one of which I have had to pull the steering box apart twice already as one of the gears has lost some teeth due to not so gentle treatment), so my interest has been piqued again, hence me doing some searching about my Hornet (and Terra Scorcher that I got later, 58075) in order to get it up and running again. I will now have to double check I still have my 4×4 Offroader, then see if I can get that working too. Had a blue one as a kid and loved it, but stripped the gears after many hours of use and sometimes abuse. Then my parents got me the newer black version with the wing and lower profile tires and got a bunch more use out of that one. Forget what happened to it though. Anyway, a couple years ago I got a hankering to own one again and picked up a yellow one in great shape without transmitter for around $35. Modern RC things is one of my hobbies, so I took all the original boards out and replaced everything but the motor with hobby grade parts to get better performance. It works wonderfully! Interesting post, I just took mine out of storage after about 30 years, got them (both yellow and blue in 1984) and powered them up, they both ran great. Just put them back away…without batteries so I can play with them again next Christmas! Purchased them for my kids when they were little, I think I played with them more than they did. Now they are 30 years old. I have mine sitting on a shelf at home waiting for me to repair it. Doesn’t switch on or anything now Going to take it apart and see if I can find out why. Assume just patiently following through circuits with a multimeter should help after cleaning up all the contacts etc. My fingers are crossed! If not I am going to try fitting hobby parts and bump the performace! Wow, alot of comments about this one! I believe my father still has a blue 4×4 stashed away in it’s box somewhere, with maybe an hour of runtime if lucky. I grew up in a country town, no hobby shop, but we did have a Tandy/RS!!! Well I stripped my yellow truck down. Cleaned Transmitter sliders, reassembled, transmitter fires up ok. Stripped down truck, switches on, red LED lights up. Shorted power to the motor in the rear and that spins, just no response from using the control…I cannot see anything obviously burnt out on the PCB and I cannot see any loose wires, all look good. Battery power seems to be flowing through all the battery leads to the main board. I guess its either one of the resistors or board components blown or the receiver component is bust. Any body got any ideas how I can ger her rolling again? Any body got a smashed up truck with a working board ? WooHoo! cleaned up a few of the contacts in the truck and handset and now have a fully funtioning truck! First time in about 15 years the thing has run! Nice to hear this Tom! Oh wow, great article. I’m so glad to see it is fondly remembered, I didn’t think I’d have any luck finding it on the net. I had one of these in the UK in 1985, the yellow one. I really loved it and it gave me a love of RC to this day. The year before that I got the Radio Shack Sherman tank. I’m misting up here haha, I’d love to own them again! Hello There. What an awesome looking vintage truck. I have the blue model. I am experiencing a problem with the steering. Whenever I push the steering on the RC either left or right, the truck kinda short out if it is going forward or backward. Any remedy? Hi Chris – my advice would be to first make sure the contact points inside the transmitter are clean. It’s an easy transmitter to pull apart, and just use a clean cloth to ensure the contacts are free of grease and dirt, as this is a common cause of problems on this model. Hi my husband has one of the blue off roaders and the tires are cracking any recommendations on what to replace them with and lastly of course we don’t have the remote can you buy one that is programmable? Hi Stephane, there’s not really any “programmable” controllers, but a similar remote of the same frequency (usually 27 or 40MHz) can often be substituted from a different toy rc vehicle. Another option is to replace the electronics with mild modern day hobby grade units, but a bit complicated. As for the tyres, don’t know any direct replacements but can recommend you store the truck with the weight off the tyres (put something underneath the chassis to hold it up). Great truck. Thanks for the information! I found a blue 49 in my wife’s uncle’s garage it still has the remote with it too. Same batteries in it too radio shack. Didn’t know it was a collector idem. Also have a NASCAR canned heat rc car by Tyco never been opened. #6 Mark Martin. I here people are looking for these as well. doe’s any one know any thing about the 1-10th red roader by Tandy radio shack. got one in mint condition but don’t know if it’s a toy or R.C model, thanks. Hi Larry – the Red Roader is a ready-to-run R/C model made by Taiyo. It was sold in Tandy/Radio Shack stores in some countries in the mid 1980s. Not sure if it’s 1/10th scale though? I thought it was a tad smaller. Is it not “hobby grade” – as in, it was not a kit model, and did not have spare parts availability. But is still has value, as many ready-to-run “toy” R/C models today are just as collectible as hobby grade kit models, depending on their quality, ability and condition. I would suggest the Red Roader is quite desirable, and mint/boxed examples are extremely rare. I hope to have contributed to the general knowledge of this toy. It was a very good RC to be a toy grade and always liked the orange colour very much. I just saw a kid playing with his remote control car in the street and it reminded me how I had a yellow one of these when I was a kid but someone stole it when my folks took me to the beach. Man, I cried for days! This Blog is up there with one of my best finds for the day! I’ve gone over to eBay now to try and reclaim my childhood with one of these bad boys again! Appreciate the compliments 🙂 I can only imagine the disappointed you would have felt for sure! Nice post. I purchased one of those from Tandy or Radio-Shack in 80’s when I was on Sony service course. Now my sons found the car and it is still working. But unfortunately both of back wheels are smashed due to some heavy load during storage. I’ve tried to find two 90.00 – 38 – 50 tires but haven’t succeeded yet. If you have any idea where to find a pair, I would be very happy. Hi Matti. Probably your best bet honestly, is to buy another of the same car on eBay and use the tyres from it. Such as buy a non-working one cheap, and use it for parts. Then you will have the exact tyres you need.